Need mics for your SHOW? Do you need more mixing capacity? Players also have the latest digital stagebox come mixer for hire - the Behringer X-Air 18. 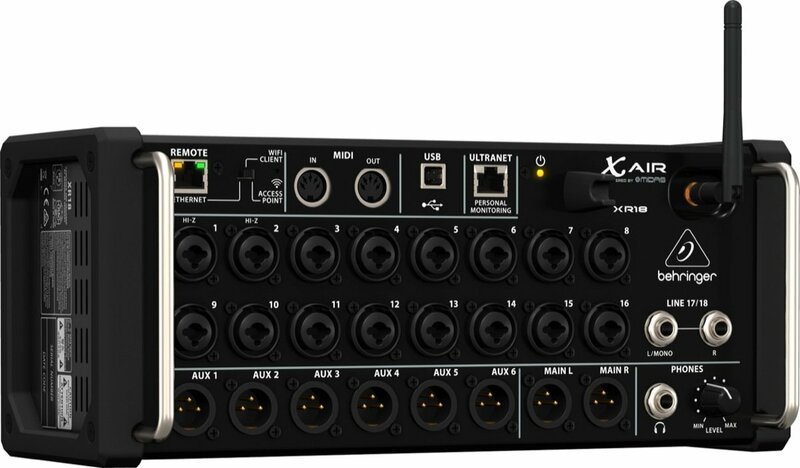 This little miracle offers up to 18 channels of control, with EQ, reverb, compression and gating on every channel; 6 aux sends, and the ability to provide individual mixes for stage performers, all controlled by a tablet, phone or PC/MAC (or all three at once)! In a rack unit with 4 XLR flying tails, we have 4 back packs which can be used with individual mic heads or Madonna headsets. High gain, two aerial set-up to ensure clean sound. Available for hire, with or without an operator. In rack units with 12 x XLR termination panel and leads, we have 12 back packs which can be used with individual mic heads or Madonna headsets. High gain, two aerial set-up to ensure clean sound. Available for hire, with or without an operator. © Maidenhead Players 2019. Design: Martin Stanford and HTML5 UP.